The new hay buyers help sheet is designed to make buying commercially grown hay as painless as possible for our newest customers.While much of it's information has been copied on other websites thru the years,it has never been duplicated. How is our product different? Unlike traditional hay sellers, we have a tracking program on our hay that will, in the event of damage or loss, allow us to contact you the buyer and alert you to any problems This allows us to "recall" our hay after if has been sold should the need arise. Likewise, you must call in with that lot number and if possible, buy the same has that you were sold before avoiding digestive upsets in the feeding program as the hay types are clearly labeled. So, no more feeding "accidents" by the hired help.If any problems arise with your hay, you may call us and upon confirming the lot number, we will be able to replace hays by avoiding the damaged lot numbers. Finally,new to the Southeast, we sell our hay shrink wrapped and on pallets which slows leaf shatter and loss from the bales and allows for a much higher volume of hay to be stored neatly and safely in a smaller area. What is your delivery fee and your minimum order?? We actually have neither as the rate will be the same for a 20 foot gooseneck or a 53 foot semi truck. Fuel and driver time is similar regardless of load size.We have mechanical unloading that allows a full semi truck to be unloaded in less than one hour so the end customer is spared hours of backbreaking truck hand unloading. Our delivery fees include unloading from the trucks to the ground with our machines so there is no hand labor involved. 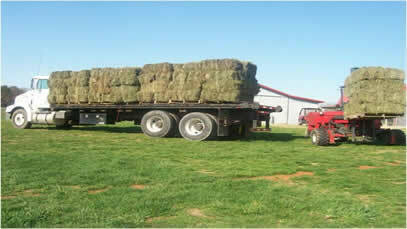 The same delivery fee buys one bale delivered or as much as a truck can legally haul. So,cost effectiveness for the end user depends on full loads.Sadly due to abuses of the return policy we are now limited to a 300 mile delivery radius.You are welcome to come yourself or send a truck over that distance. I'm ready to get a load of hay...what now?? 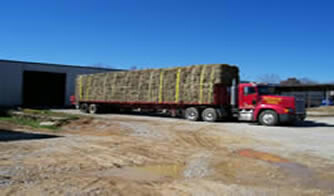 Just call or email us.We can sometimes have a load of hay on the road within 48 hours depending on weather and crop availability and the trucking company. Four business days is our normal turnaround.But in times of water or drought stress this can be as much as a month.That is just part of the joys of farming. The key will be when you place your order and the line in front of you. Please be aware that we require payment on arrival for all customers.Also if you have questions about grade or RFV or hay types please call for clarification. We need less than a full semi, can we pick it up ourselves?? Of course ! We started selling commercial quality hay over a decade ago and we have never forgotten the 100 bale a year regular customers. Please ring 423.346.7909 for an appointment time and we will be happy to show you the stockpiles and help you pick a hay that fits your budget and needs. Normally one ton of hay fits into the bed of a 3/4 ton PU truck. Loading hours normally can be arranged from 8 am to 4 pm Monday- Friday, please call before you leave to make sure we are here.We cannot be responsible for your long wasted trip, made on winding roads, without an appointment. We take cash,good checks,wire transfers.All transactions come with invoices or sales receipts.Also please keep electronic label for hay after arrival. A hallmark of our farm has always been both good hay and the ability to replace defective hay purchased from us. 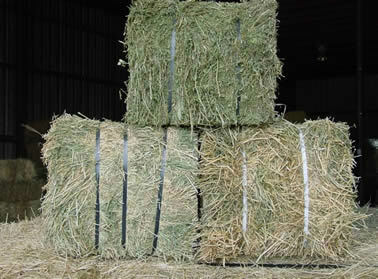 All hay, unless noted at time of sale, is sold as "guaranteed" or with refund. This means in simplest terms if the hay is defective (mold, dead critters, wrong type) we will replace the hay or credit the next purchase for the damaged hay dollar amount, So, $400 of grass hay can be replaced with $400 of another hay, but only if the hay is returned and the damage has been reported to us immediately.Exchanges are based solely on dollar amount not tonnage. All our hay is sold on the RFV Grading Program. But,we are not responsible for poor storage at your farm. If your barn leaks on the hay or molds from the bottom from ground storage, we will not be responsible. If your storage trailer has a leak, we are not responsible. If you have covered your hay with a tarp and it has molded we are not responsible. The easiest way to determine this, is that hay that molds from the inside out is the fault of the grower and hay that molds from the outside in are an end user fault. We are a real working farm and therefore maintain farm tags on our own semis. Our trucks will be more than happy to deliver your load to you within the 300 mile radius,however some customers are a good distance from us and it is cheaper to have a common carrier deliver their load. This is not a problem - we have freight brokers that assist us in finding good trucks to deliver your load in the safest, cheapest, and quickest means possible.Unless you have paid for the service, we do NOT hand stack at the end destination. Speed loading the trucks as the balers run in the same field. Are you ready to see the hay ? ?